Fowl is the common name for any of the gamefowl or landfowl comprising the bird order Galliformes, or any of the waterfowl comprising the order Anseriformes. Galliforms or gallinaceous birds include such as pheasants, turkeys, quail, and chickens. Anseriforms include such as ducks, geese, and swans. Based on anatomical and molecular similarities, these two orders are often, but not universally, placed together to comprise the fowl clade Galloanserae. However, the term fowl is not a formal taxonomic grouping and often is used less precisely, including being limited to the various birds in Galliformes or to any wild or domestic birds used as food or hunted as game. Fowl offer important ecological, commercial, aesthetic, and culinary functions. Many birds that are eaten by humans are fowl, including poultry such as chickens or turkeys, game birds such as pheasants or partridges, wildfowl like guineafowl or peafowl, and waterfowl such as ducks or geese. Some, such as chickens and turkeys, are part of a large international trade, while some, such as ducks, turkeys, and pheasants, are sought after by hunters for sport. Peafowl, such as exemplified by the extravagant tail of the peacock, offer great aesthetic value, as do ducks, geese, and many other fowl. Ecologically, fowl are important components of terrestrial and aquatic food chains. Most or all birds collectively referred to as fowl belong to one of two orders, namely the gamefowl or landfowl (Galliformes) and the waterfowl (Anseriformes). Galliformes contains more than 250 living species worldwide, including such familiar representatives as turkeys, grouse, chickens, quails, peafowl, and pheasants. They are characterized by stocky built, small head, strong feet, and often short bills and wings, and adult males typically have sharp horny spur on the back of each leg. Anseriformes contains about 150 living species of birds in three extant families: the Anhimidae (the screamers), Anseranatidae (the Magpie-goose), and the Anatidae, which includes over 140 species of waterfowl, among them the ducks, geese, and swans. All species in this order are highly adapted for an aquatic existence at the water surface and all are web-footed for efficient swimming (although some have subsequently become mainly terrestrial). Interestingly, various studies of anatomical and molecular similarities suggest these two groups were close evolutionary relatives and together have been placed in the clade scientifically known as Galloanserae (initially termed Galloanseri) (Sibley et al. 1998). This clade is supported by morphological and DNA sequence data (Chubb 2004) as well as retrotransposon presence/absence data (Kriegs et al. 2007). Thus, many avian systamatists regard galliformes and anseriformes as sister taxa. However, Ericson et al. (2001) report that morphological and molecular evidence suggests that Galloanserae are not a monophyletic group and that the anseriform-gallifrom relationship is not supported. While fowl commonly is used for members of Galliformes and Anseriformes, the term poultry typically is used for any kind of domesticated bird or bird that is captive-raised for meat or eggs. For example, ostriches are sometimes kept as poultry, but are neither gamefowl nor waterfowl. However, in colloquial speech, the term "fowl" often is used nearly interchangeably with "poultry" or even "bird," and many languages do not distinguish between "poultry" and "fowl." If Galliformes and Anseriformes are considered to form a monophyletic group then the distinction between "fowl" and "poultry" gains greater support. 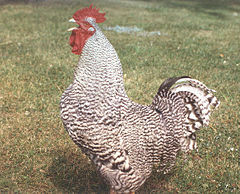 Sometimes the term poultry or fowl also is included in the term livestock; however, livestock generally refers to any domesticated mammal intentionally reared in an agricultural setting for the purposes of profit or subsistence, whether for food, fiber, dairy, draft, breeding, sport purposes, or other product or labor. As such, livestock typically includes animals such as cattle, horses, sheep, and fur-bearing animals, but does not include poulty—farmed birds such as turkeys, chickens, and geese. While they are extremely diverse ecologically, morphologically, and ethologically, there are still some features which unite water- and landfowl. Many of these, however, are plesiomorphic for Neornithes as a whole, and are also shared with paleognaths. Galloanserae are very prolific; they regularly produce clutches of more than five or even more than ten eggs, which is a lot for such sizable birds. For example birds of prey and pigeons rarely lay more than two eggs. While most living birds are monogamous, at least for a breeding season, many Galloanserae are notoriously polygynous or polygamous. To ornithologists, this is particularly well-known in dabbling ducks, where the males literally band together occasionally to mate with unwilling females. The general public is probably most familiar with the polygynous habits of domestic chicken, where usually one or two roosters are kept with a whole flock of females. Hybridization is extremely frequent in Galloanserae, and genera, not usually known to produce viable hybrids in birds, can be brought to interbreed with comparative ease. Guineafowl have successfully produced hybrids with domestic fowl and blue peafowl, which are not particularly closely related as Galliformes go. This is an important factor complicating mtDNA sequence-based research on their relationships. The mallards of North America, for example, appear to have been derived mostly from some males that arrived from Siberia, settled down, and mated with American black cuck ancestors (Kulikova et al. 2005). Galloanserae young are remarkably precocious. Anseriform young are able to swim and dive a few hours after hatching, and the hatchlings of mound-builders are fully feathered and even able to fly for prolonged distances as soon as they emerge from the nest mound. Fowl are considered to have been the first neognath lineages to evolve. From the limited fossils that have to date been recovered, the conclusion that they were already widespread—indeed the predominant group of modern birds—by end of the Cretaceous is generally accepted nowadays. Fossils such as Vegavis indicate that essentially modern waterfowl, albeit belonging to a currently extinct lineage, were contemporaries of the (non-avian) dinosaurs. As opposed to the morphologically fairly conservative Galliformes, the Anseriformes have adapted to filter-feeding and are characterized by a large number of autapomorphies related to this lifestyle. The extremely advanced feeding systems of the Anseriformes, together with similarities of the early anseriform Presbyornis to shorebirds, had formerly prompted some scientists to ally Anseriformes with Charadriiformes instead (Benson 1999; Feduccia 1999). However, as strong support for the Galloanserae has emerged in subsequent studies, the fowl clade continues to be accepted as a genuine evolutionary lineage by the vast majority of scientists. Apart from the living members, the Gastornithiformes are probably a prehistoric member of the Galloanserae. Benson, D. 1999. Presbyornis isoni and other late Paleocene birds from North Dakota. Smithsonian Contributions to Paleobiology 89: 253-266. Chubb, A. 2004. New nuclear evidence for the oldest divergence among neognath birds: The phylogenetic utility of ZENK(i). Molecular Phylogenetics and Evolution 30: 140-151. Ericson, P. G. P., T. J. Parsons, and U. S.Johansson. 2001. and molecular support for nonmonophyly of the Galloanserae. In C. J. Gauthier and L. F. Gall (eds. ), New Perspectives on the Origin and Early Evolution of Birds: Proceedings of the International Symposium in Honor of John H. Ostrom. New Haven: Peabody Mus. Nat. Hist., Yale Univ. ISBN 0912532572. EvoWiki. 2008. Galloanserae: A critical examination. EvoWiki version of May 21, 2008. Retrieved November 11, 2008. Feduccia, A. 1999. The Origin and Evolution of Birds, 2nd edition. New Haven: Yale University Press. ISBN 0300078617. Kriegs, J. O., A. Matzke, G. Churakov, A. Kuritzin, G. Mayr, J. Brosius, and J. Schmitz. 2007. Waves of genomic hitchhikers shed light on the evolution of gamebirds (Aves: Galliformes). BMC Evolutionary Biology 7: 190. Retrieved November 11, 2008. Kulikova, I. V., S. V. Drovetski, D. D. Gibson, R. J. Harrigan, S. Rohwer, M. D. Sorenson, K. Winker, Y. N. Zhuravlev, and K. G. McCracken. 2005. Phylogeography of the mallard (Anas platyrhynchos): Hybridization, dispersal, and lineage sorting contribute to complex geographic structure. Auk 122(3): 949-965. Retrieved November 11, 2008. Erratum: Auk 122(4): 1309. Mindell, D. P., and J. W. Brown. 2007. Galloanserae. Tree of Life Web Project version March 07, 2007. Retrieved November 11, 2008. Sibley, C. G., J. E. Ahlquist, and B. L. Monroe. 1988. A classification of the living birds of the world based on DNA-DNA hybridization studies. Auk 105: 409-423. This page was last modified on 21 November 2008, at 14:42.